Chapin and I had dinner out this weekend at one of our favorite Italian restaurants: Nino's. We have been going to this restaurant for about 10 years now, and Chapin actually almost proposed to me there. We always have such wonderful meals when we head to Nino's! Here is a picture of us before we left for dinner. I am wearing a BCBGMAXAZRIA dress with flat Marc by Marc Jacobs sandals. 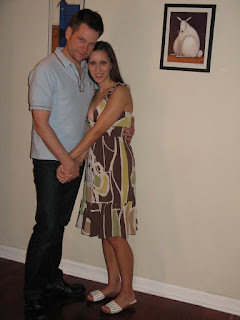 You can see how short I really am when I wear flats - especially when I stand next to my husband.